Brandon Clarke was a high school player without a college on the day he jumped into the front passenger seat of a Kia Optima at the conclusion of his unofficial visit to San Jose State in 2014. The owner of the car, San Jose State assistant coach Tyler Ojanen, had only two scholarships and wasn’t inclined to give one to a player who wasn’t attracting much interest. When he suggested Clarke enroll in school for a year, and pay tuition on his own if the scholarship didn’t work out, he was interrupted by Clarke’s mother, Whitney Triplett, who was seated in the back seat. Ojanen eventually saw Clarke play and offered him a scholarship to San Jose State, where Clarke played two seasons before transferring to Gonzaga. Now a junior with the Zags, Clarke this season has played his way into a likely first-round NBA draft pick if he decides to leave school. His dominance March 23 in Gonzaga’s win over Baylor — 36 points, 8 rebounds, five blocks — sent the Bulldogs (32-3) to their fifth straight Sweet 16, where they’ll face Florida State on Thursday. A year ago, Clarke, who was redshirted the 2017-18 season, was in his dorm room watching Gonzaga’s NCAA run end when the Zags lost to Florida State, 75-60, in the Sweet 16. This year, Clarke is lining up alongside fellow junior forward Rui Hachimura in what might be the best frontcourt in all of college basketball. To appreciate how far Clarke has come, understand the circumstances that brought him to this moment. Few colleges showed interest in him coming out of Desert Vista High School in Phoenix even though he averaged 15 points and seven rebounds while helping lead the team to the state championship game as a senior. He was a skinny, 6-foot-7-inch kid without a true position. Clarke’s high school coach, Tony Darden, said he was probably overlooked because of the large number of talented players in the state at the time. 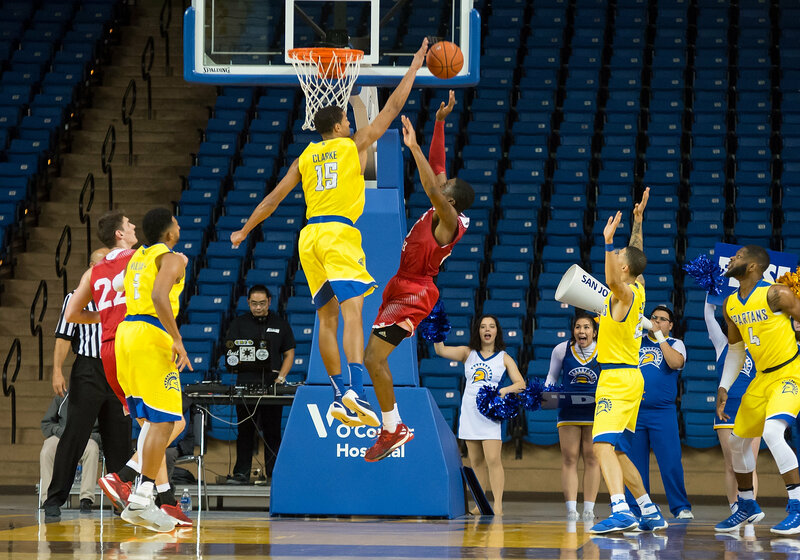 Brandon Clarke (center) denies a Southern Utah player while representing San Jose State. At San Jose State, Clarke was emerging as a good player on a bad team. And he might still be there if the school’s head coach, Dave Wojcik, hadn’t resigned after the 2016-17 season. With Wojcik gone, Clarke put himself on the market. This time, however, he could dangle stronger credentials: a 6-foot-8-inch force who earned a spot on the All-Mountain West first team and All-Defensive team. Gonzaga, Washington State, Oregon, Utah and Iowa all showed interest. After sitting out last year, Clarke was expected to be a role player this season. But the team’s best returning player, Killian Tillie, injured his ankle and missed the first 15 games. With the early absence of Tillie, Clarke stepped into a more prominent role. 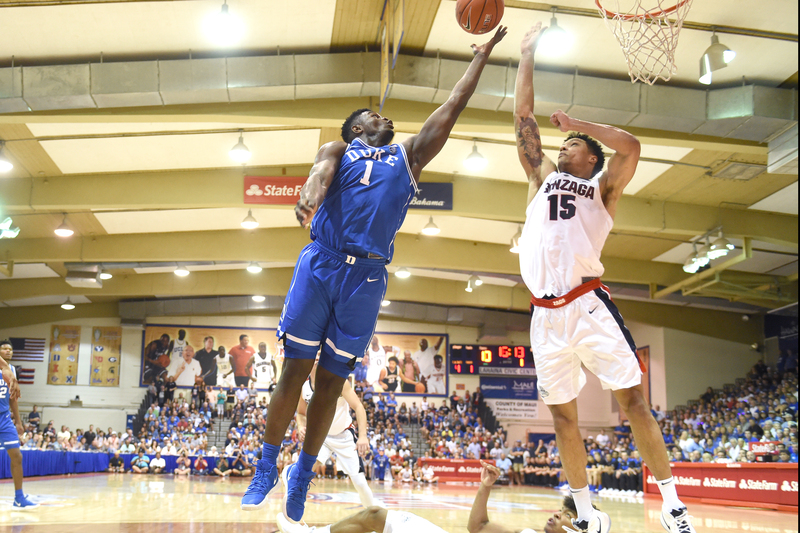 Zion Williamson of the Duke Blue Devils (left) takes a shot over Brandon Clarke of the Gonzaga Bulldogs during the final game of the Maui Invitational at the Lahaina Civic Center on Nov. 21, 2018, in Lahaina, Hawaii. In Clarke’s sixth game, No. 3 Gonzaga faced top-ranked Duke and Zion Williamson in the Maui Invitational. Clarke scored 17 points and blocked six shots — including a game-tying attempt by RJ Barrett in the final seconds to help clinch Gonzaga’s 89-87 win. His 36-point, five-block game March 23 put Clarke in rare company: only Shaquille O’Neal and David Robinson have had 35/5 in an NCAA tournament game. Clarke, one of four finalists for the Naismith Defensive Player of the Year Award, leads the nation in total blocks this season (110 combined during the regular season and postseason). That steady play all season, along with that standout effort March 23, is the reason Clarke has been soaring up NBA draft boards. Ojanen, who is now the assistant athletic director of men’s basketball at Saint Mary’s College of California, said a number of NBA teams have asked him about Clarke, who’s been compared to high-energy players such as former Phoenix Suns forward Shawn Marion and Houston Rockets forward Kenneth Faried. Clarke, who earlier this month was named to the All-West Coast Conference first time as well as the league’s Newcomer of the Year and Defensive Player of the Year, hears the chatter about this possibly being his last year in college. But he’s doing his best to cast the thoughts of a possible NBA career aside for the time being. If it happens, it will be because the stars aligned for a talented player who may have continued to be overlooked if not for a coach’s decision and a teammate’s injury.